Always on the lookout for artists who have been neglected by mainstream art history, I enjoy when a previously neglected artist finds new appreciation and reevaluation of her work. One such artist is Florine Stettheimer, who was active in the first half of the twentieth century. Even though women had gained some ground during the late nineteenth century as trained artists, the work of women artists was still not widely exhibited in the US. Interestingly enough, it was influential women who were in the forefront of introducing Americans to European modernism in the early part of the 20th century. Stettheimer was born to a wealthy family from Rochester, New York. She studied painting under academic landscape painter Kenyon Cox (1856-1919) at the Art Students League in New York. Her earliest works reveal that she was a competent draftsperson. She also studied paintings of the Baroque and Rococo artists in Germany, as well as Expressionism. She was particularly affected by the brightly painted interiors of Rococo German pilgrimage churches. She also experienced the experiments in modernism in Paris. 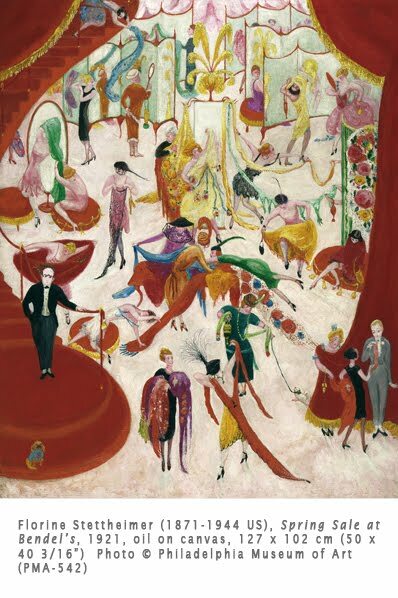 When Stettheimer returned to New York in 1914, she and her sisters Carrie and Ettie soon formed a circle of avant-garde artists which included Europeans such as Marcel Duchamp (1887-1966), Pavel Tchelitchew (1898-1958), and Albert Gleizes (1881-1953), as well as Americans like Charles Demuth (1883-1935) and Alfred Stieglitz (1864-1946). These artists experimented variously with Cubism, Dada, and Expressionism, which perhaps explains why Stettheimer turned her back on academic realism. However, she did not embrace any one European style, preferring to pursue her own path. She produced many portraits of her circle of artist friends, depicting their interactions with the American avant-garde. Stettheimer’s first and only one person show was in 1916. She meticulously decorated the gallery for the opening, covering the walls with white muslin on which her bright paintings were hung and interspersing bouquets of flowers. She had created the first feminist environment, years ahead of those created by sculptor Louise Nevelson. However, the critics panned her show and paintings, ironically scorning the opening as “feminine.” Thereafter she only showed her works to select groups of people in her New York apartment. Spring Sale at Bendel’s is a humorous look at the chaotic world of high fashion and New York’s elite. The soaring space she created is reminiscent of the great spaces of Baroque churches, while the high-key palette may reflect the influence of the painted German Rococo interiors. The composition of ambiguous space and willowy, jewel-like figures established a style that matured in her most famous works, the Cathedral series of the 1930s. In her use of fantastic, flattened forms, bright colors, and intentionally naïve space, she created a decorative surface that pointed the way to abstraction of the later 20th century. That fact, coupled with her personally nurturing avant-garde artists at a key moment in the history of American art, makes her a pioneering woman artist. A Taste for the “Exotic”?